Hello, my name is Ana and I am the Branch Manager for the Stansted Airport branch. 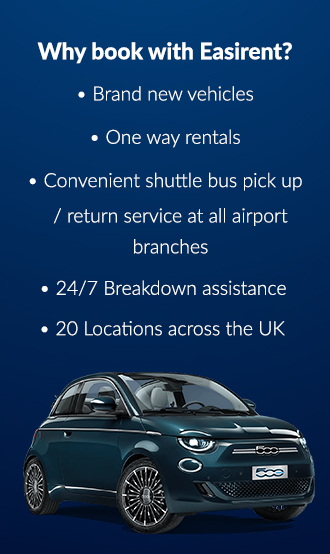 If you are flying in to STN airport and are looking to hire a car for the duration of your stay then book direct online at Easirent.com. We have a large range of new vehicles, cleaned and ready to collect from our Stansted car hire branch. Arriving at Stansted Airport by air. Collect your luggage, as you exit arrivals please call 01279 215 341. An Easirent representative will collect you from the waiting area at Zone C (outside arrivals). We also offer car hire at other London locations including major airports at Gatwick, Heathrow and central London. Arriving at Stansted Airport by train. The fastest way between London Stansted Airport and central London is the Stansted Express train which departs every 15 minutes from the station, located directly under the airport terminal. Arriving at Stansted Airport by bus. The airport’s bus and coach station is opposite the main terminal entrance and is open 24-hours a day, 7 days a week. Coaches towards key London destinations are available alongside long-distance coach journeys such as Birmingham and Liverpool. Dropping off your Easirent car at Stansted Airport. Conveniently situated just off the M11 motorway – use Junction 8a if approaching from the London direction or Junction 8 from the Cambridge side, then follow signs for the airport. -Baby changing facilities in both ladies and gents toilets in zone A check-in area. -Baby changing and nursing room located in the Main departure lounge. -Gates 1 – 19: family room near Gate 13. -Gates 20 – 39: family room near Gates 33/34. -Gates 40 – 50: family room near Gate 43. -Gates 51 – 59: family room near Gate 59. -Gates 81 – 88: baby change with accessible toilet and ladies toilet. -International Baggage Reclaim: family room near reclaim 1, baby change cubicles in both ladies and gents toilets near reclaim 9. -UK Baggage Reclaim: baby change in ladies toilet. -Main arrivals greeting area: baby change cubicles in both ladies and gents toilets. Most restaurants and bars provide high chairs and children’s menus. Branches of Boots pharmacy supply baby essentials including nappies, formula milk and baby wipes. The airport information desk is in the international arrivals area. It is open 24 hours a day (except Christmas Day) and provides help with general airport enquiries, flight information and paging calls. Internet kiosks are available before and after security control. You can also print at kiosks from any internet device, including laptops and smartphones. These services are operated by Arqiva, please see the internet kiosks for more details. Free wi-fi is available throughout the terminal for 60 minutes per registered device per day. Users complete a simple registration process and once completed the network will recognise previously registered devices and automatically connect you. The free network is _stanstedairport. Toilets are located throughout the terminal with disabled toilets offering baby changing facilities for parents. A first port of call for last-minute holiday essentials and pre-flight relaxation. Combining everything from freshly made snacks to designer fragrances, passengers can take advantage of the very best of the high-street when shopping at Stansted Airport.